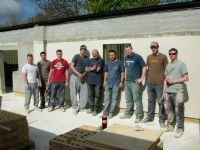 NVQ Plastering Courses at Goldtrowel are full on 3 week NVQ Plastering courses and our plastering courses are second to none. This 3 week course is only the training for the NVQ Level 2 and DOES NOT include the NVQ . If you wish to gain the NVQ Level 2 you should look at our 4 Week NVQ Level 2 course or our 6 week NVQ Level 2 and City & Guilds course. This course is suitable for complete beginners. 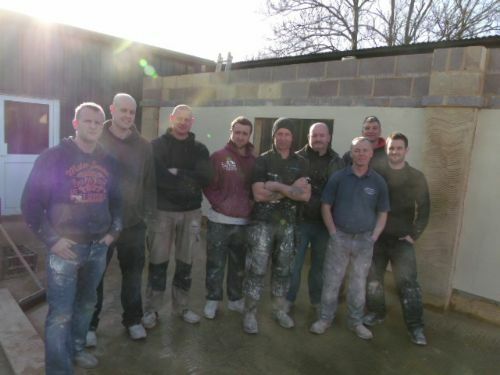 This is an Intense NVQ Plastering Course which is suitable for complete beginners. Please read what you'll recieve for your money and then do a comparison. We do NOT rush our training it's just that we believe that you need to be on the tools from the start, it's the only way you learn. THIS IS TRAINING ONLY AND DOESN'T INCLUDE THE NVQ. Please be advised of the following. We constantly get a flow of students from other Training Centres that are not satisfied. This is clearly evident from students reviews that other providers do not teach the best way Or have a Centre that is as realife as possible. We invite all potential students to visit us prior to booking with any other Training Provider. We are highly skilled have more than 75 yrs experience within Plastering and we do know our Craft. If you can find a course that matches Our Standards, Quality of Training and years of experience than what we offer we will price match and discount your course. 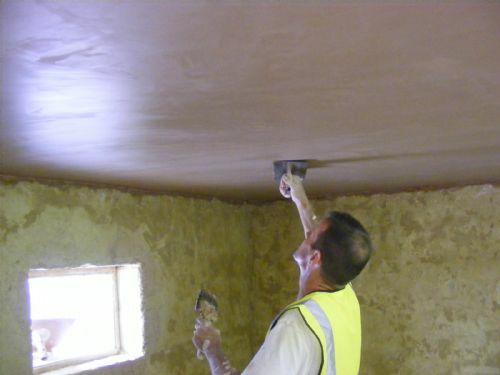 "We are Plasterers that teach Plastering" and have many years of experience. Contrary to what other providers say on their websites, we 100% deliver and certifiate the NVQ Level 2 from start to finish. Q. "Why we are different to any other provider"? A. "Come and see for yourself and ask the students" It's not the distance that you travel to a course, It's the Quality of the Training in Real life Scenarios. 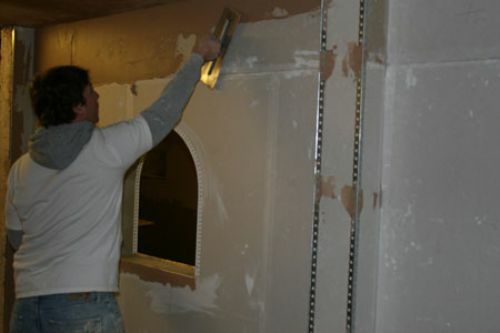 If you want a change in Career and have no experience we will get you qualified as a Plasterer. Or your money back. 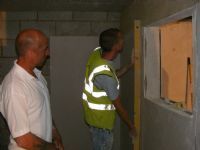 The Pictures of our Plastering facility are more than adeqate for your course. 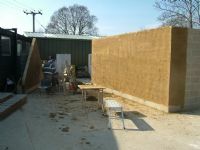 We also have a dedicated outdoor Rendering Centre. we have vast amounts of proper decent size areas for you to learn in. You do not share areas whilst completing your training. Pay-As-You-Train options to suit your needs are also available. In other words you can pay for your course by instalments. You can stagger your course to suit your needs. If you would like to do this course but are unable to complete it in 3 straight weeks and would like to stagger the course, complete it over weekends or would like to know how you can stagger your payments and pay as you train please call the office and our friendly staff will help you arrange a course structured around your needs. 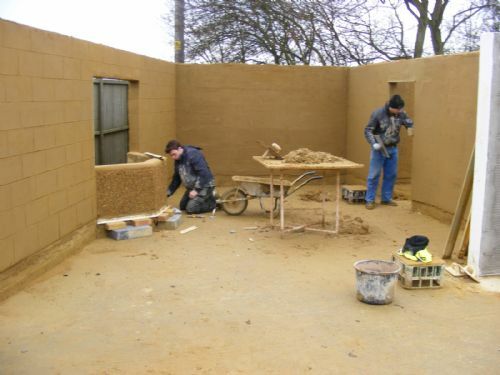 By taking your NVQ L2 plastering course at Goldtrowel you will be fully trained in solid plastering and you can be assured the 3 weeks will be full and intense to help you gain the knowledge, skills and confidence you will need to achieve an NVQ Diploma Level 2. We pride ourselves in our exceptional high standards. 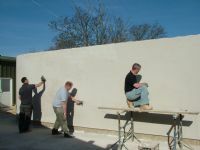 We have unlimited amount of space and we like to see as much skimming and floating done as possible. This course will act as your underpinning knowledge to progress you to achieving an NVQ Level 2 in Plastering once you are working in the Plastering industry. The next step is to just let us know when you would like to progress to this stage. Goldtrowel is a Construction Awards Alliance Approved NVQ Diploma QCF Assessment Centre No 12570. Upon booking on this course you will receive the following training material. Prior to starting your course please watch the Goldtrowel Plastering Tutorials and study the Plasterers Training Manual. 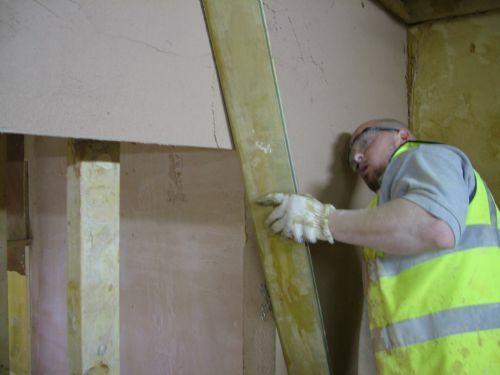 Plasterboard your ceiling in your allocated room, learn how to cut and fix boards correctly, plasterboard the walls using the direct bond method (dot and dab) with adhesive, construct an arch to a specified shape and size. Cutting correctly thin coat beads to all external angles, scrim taping all joins in plasterboards to ceiling walls and internal ceiling and wall joins and wall to wall joins. 2 coat skim the ceiling over plasterboard. Float all the walls as a backing coat, the use of scratch coats and screeds to be used as well as free rule, flat render. 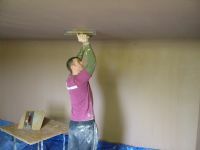 You will learn how to free hand all external angles, bullnose corners etc..
Move into your third room seal glue and 3 coat skim ceiling to a curve if required, you will be using the trowel float trowel method of 3 coating a ceiling, you will be shown how to straighten the ceiling lines with the use of a featheredge, you will 2 coat skim the walls and these will be expected to be perfect. Complete floor screed using inverted manholes and drain pipes, up to date specifications using cellutex insulation.We will discuss any areas that we feel you need more tuition with, you can also let us know what areas you would like to practice more with, we will accommodate, this so when you leave you are capable of completing jobs to a professional and high quality standard. This is just about as good as it gets. Complete method of work statements. Quantity Surveying of individual jobs. Even though you will complete all training for all Units for the NVQ, We actually give you far more in every aspect than any other Centre. 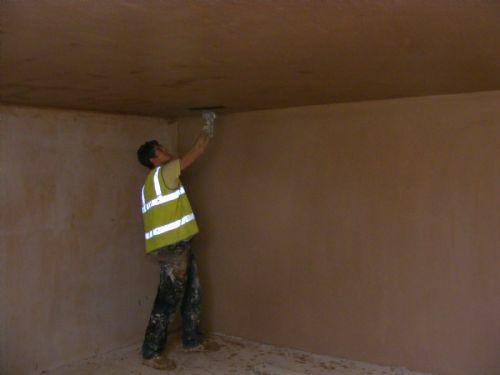 For plasterers with more than 5 years experience we recommend you take the EWPA (Experienced Worker Practical Assessment Route) Goldtrowel Plastering EWPA assessment. 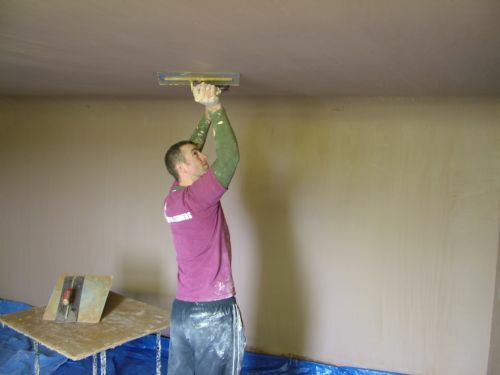 You will need to be employed/self-employed in a role that is related to Plastering for more than 5 years; you will need to provide proof of this. These qualifications (NVQs) focus on practical skills and knowledge. Developed and approved by people who work in the industry, they are a great way to get into construction or to boost your career by developing new skills and knowledge through the assessment of work based competence. QCF is the new system by which training providers can create and validate qualifications in England, Scotland, Wales and Northern Ireland. Its purpose is to allow to learners to get their qualifications in the way which is convenient for them, with a wider range of opportunities than the NVQ system currently allows. Because QCF courses are created in part by the employers themselves, you will have a much more solid assurance that the skills which the courses teach are relevant to the job itself - and that means ones which will be more sought after by your prospective employers.. They recognise smaller steps toward learning, and give learners the chance to work toward their qualification little by little. They enable work-based training courses to be officially recognised. They allow easier transfer of qualifications between European countries, thanks the European Qualifications Framework (EQF).